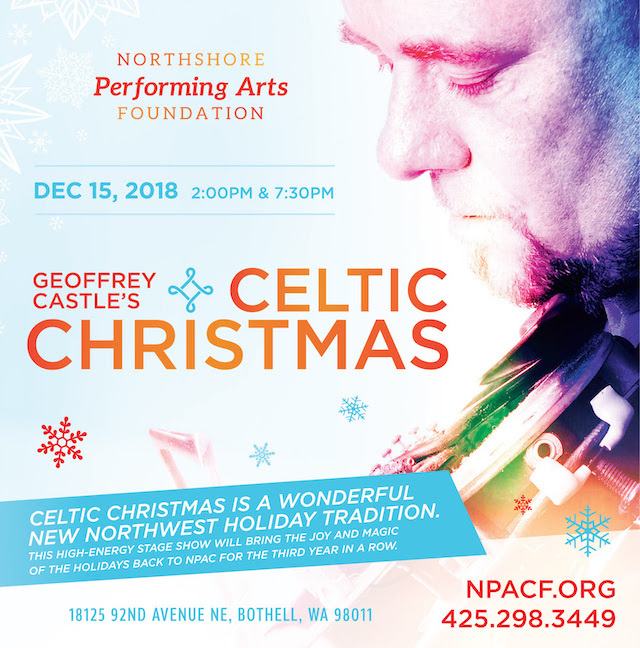 Celtic Christmas is a wonderful new Northwest holiday tradition. This high-energy stage show brings the joy and magic of the holidays back to Northwest Performing Arts Center for the third year in a row. A theme of Castle’s career is to destroy people’s pre-conceived notions of what is possible on a violin, which he does every time he takes the stage. A bandleader and solo artist — with several critically acclaimed releases on his own Twisted Fiddle Music label — Geoffrey Castle has also managed to share stages with an illustrious group of musicians including Blues Traveler, all of the original and current members of Heart, Buddy Miles, and Alan White of Yes. Two shows on Saturday, December 15, 2018 at 2:00pm and 7:30pm at the NPAC, 18125 92nd Ave NE, Bothell 98011.